PAM: Hi everyone, I’m Pam Laricchia and this is episode number 100 of the podcast. It’s the 29th of November, 2017, as I record this intro. And yay for episode 100! It’s been a great ride. Both more work and more joy than I envisioned starting out. And as I mentioned a few weeks ago, I thought I’d take this opportunity to reflect a bit on the podcast and on my unschooling work in general. With my youngest, Michael, turning twenty this year, I began to feel like I should be moving away from writing and talking about unschooling. Won’t I look silly, clinging to something that I’m no longer even actively doing? That’s been buzzing around for a while so, last month when we were on vacation, I took a long walk on the beach and contemplated my next steps. And you know what I realized? I still find unschooling FASCINATING. I think it’s because, at the root of it all, it’s about being human, it’s about living an engaged life. We are all learning and growing throughout our lives. And to grant that agency to our children, and to ourselves, is such a valuable gift. Then I started thinking, what if, instead of distancing myself from unschooling, I dove deep into my obsession with it? The thought of that was so freeing and exciting! I was practically skipping down the beach at that point. All of a sudden, my mind was swirling with all the different ways I could connect unschooling information with people curious to learn more about it. Since I returned home a month ago without that cloud of “you should move on” weighing me down, I’ve been contemplating what I’d love my unschooling work to focus on and that’s what I want share. First, I want to publicly commit to producing another 100 episodes of the podcast and I really hope you’ll join me for the journey! Definitely as a listener, and possibly as a Patreon supporter, if that’s something that feels good to you. The Patreon support over the last year has been amazing—thank you guys so much! Your support now covers the hosting and transcriptions costs, and it would be wonderful to begin to cover some of the many hours I dedicate to this work each month. I also commit to continue writing about unschooling. Not only with the Unschooling Journey book I have coming out in the next couple of months, but more books, articles, and blog posts. And not only my own writing. Weaving together my passions for unschooling, writing, and publishing, I’m excited to officially announce the creation of Forever Curious Press: an independent small press focused on books about unschooling. This is something I’ve contemplated for a while and it feels great to dive in with both feet now. Over the years, I’ve noticed experienced unschooling parents who were interested in writing a book to share their knowledge and insights, but they weren’t particularly interested in learning the ins and outs of both print book and ebook production, nor in keeping on top of the rapidly changing world of publishing. Completely understandable. Yet it’s meant that some great books about unschooling are not widely available in the formats today’s readers are looking for. And with Forever Curious Press, I’m thrilled to open up that pathway. 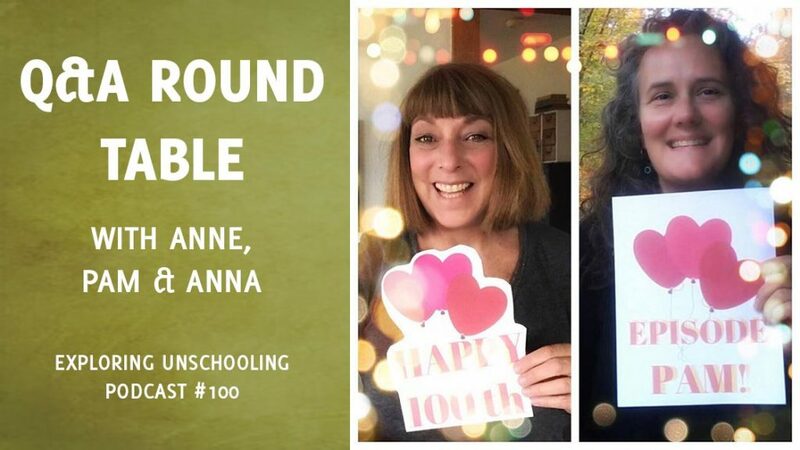 To seamlessly connect solid unschooling books with people curious to learn more about unschooling. I’ve now got the website up: forevercuriouspress.com and the first book being published is the ebook edition of Homeschooled Teens, by Sue Patterson. A few years ago she conducted a detailed survey and collated the results so we could find out first hand what 75 teens and young adults have to say about their experience being homeschooled through the middle and teen years. I spoke with Sue about the book last year on the podcast and I’m happy to be working with her to bring out the ebook edition. We’re completing the last steps of production and it will be available soon. I also commit to regularly running the Childhood Redefined Online Unschooling Summit. We opened it up for the first time in September and the feedback from the first group has been wonderful! And connecting with them and answering questions in the private Facebook group has been an amazing experience. One of the huge benefits of having the Summit content online is that it’s completely self-paced but we chose to close registration so that we could focus our efforts on supporting the participants as they work through the content. That means we’ll be opening up registration for the next session in the new year. If you’re curious learn more about it, you can check out the website at childhoodredefined.com. So, between the podcast, the books, and the Summit, I’ve built various ways to share unschooling information so that people can learn and engage in the ways they prefer. But what I really want to know is, how can I help YOU on your unschooling journey? To answer that, I’ve put together a short survey and I would love if you would participate! It will take less than five minutes of your time and give me some solid information about how I can best help YOU. I’ll put the link in the show notes and keep the survey open for two weeks. I’d love to hear your thoughts! And I think that’s about everything that’s been swirling around in my head the last month or so! Thanks so much for being here for episode 100. And if you have a chance to check out the image card for the episode, please do! You’ll see the wonderful picture that Anne and Anna surprised me with to celebrate this milestone!! I thank them so much for being a special part of my journey. And best wishes to you all as you continue on your unschooling journey. I am humbled to be invited to travel beside you. Thank you. And now, finally, let’s get to your questions! PAM: Welcome to another Q&A episode! I’m Pam Laricchia from livingjoyfully.ca, and I’m so happy to be joined again by Anne Ohman and Anna Brown. Hi guys! PAM: We have some great questions this month, would you like to get us started, Anne? So, I’m curious how you would share thoughts about something like racism & sexism & outdated stereotypes? During the movie when it’s happening? After its over? Not at all if the child doesn’t seem to have noticed it? I’ve thought about this in other contexts, like in stories when adults are dismissive of children, or use punitive discipline, etc. Its so frequent that what I believe about parenting and about people differs from the mainstream, that I feel like I need to put my voice in there to keep my son from getting all his ideas about social norms from sources I don’t agree with! Thanks for your thoughts & ideas! ANNE: Hi Jen! I so hear you and I am sure most everybody listening to this podcast hears you too because we’re all here on this radical unschooling path because we reject much of mainstream society’s stories and beliefs. I just want you to know that you can just breathe. There is no urgency with this and here is why: First of all, your son is two and he is over here, in life, really loving so many things. He is enjoying what is in front of him and you know what, he wants you to see the things that he loves from his eyes. He wants to delight in that crocodile with you. So, where are you? Are you way over here, far away from him, holding onto a fear and maybe holding on to disapproving energy, judging this thing that your son is finding such delight in? So, that was my introduction to attachment parenting. My mothering instinct to listen to and follow my child’s innate knowing in what he needs and that innate knowing of my son has been protected and valued and nurtured and celebrated and he is twenty-seven now. It also allowed me to question absolutely everything I had been handed all my life by mainstream society. That is what we do, right? As radical unschoolers we question things. We have said, “Wait it is not true that all children have to go to school to learn.” And if you think about it, is it not our children who brought us to that place of knowing that truth? I immediately recognized the greatest opportunity for growth and awareness in my life was to listen to and follow and learn from my children. Yes, I felt I had a few things that I could share with them too, but I understood that was not my real purpose here as their mother. My real purpose is to protect, respect, trust, follow and celebrate my children with innate knowing and allow it to continue to shape who they are and the choices they make and the paths they will take. So, in doing that, it is not my place to hand them things that I think I know from my own life experiences and definitions and beliefs. If I were to hand them all the things that are mine, then that would not allow them the space to know what is truly theirs. Along with handing them those things, there is often the expectation that they take these things and believe them for themselves even though they did not come from the child’s own life experiences and definitions and their ponderings and their questions and their answers. Think about that, is that not what schools do? And is that not the thing that we did not want for our children? For them to believe and own anything that was handed to them outside of their own heart? So, here you are in your life with your beautiful son and you have already chosen to not buy into mainstream societies untruth about so many things. You are already living this life of freedom from societies expectations to buy into their story. So, you can really let go of this urgency you are feeling to alert him to all of these injustices that are around him and hiding in the very things he is finding enjoyment from. You are not sending him to school, you are creating a life with him where he is allowed this glorious sacred space to listen to his own inner voice and come to answers that feel right to him in his own time and in his own way. You will be having conversations about absolutely everything. As you said, he is so young right now that it is not a place to have these conversations. But they will come up during these amazing years that you will be spending together exploring the world, following your child and his heart and his observations, questions and answers that he comes up with from his amazing innate knowingness. Those conversations are awesome. Ours were from a mutually respective partnership. The child observes and you both discuss, child shares how he feels. I would validate how my child felt. The really cool part is when the child gets to kind of file that conversation away. He gets to ponder again on that at a later time when he needs it. When something else comes up and brings up the same feelings and he revisits what he already felt about it before and what you discussed about it and he will add onto that what he is feeling now. You will have more conversations, again and again all at his different levels of awareness. The cool thing is that life is so glorious and it gives us exactly the right opportunities for growing and stretching and learning and pondering right when we need them. So, that is why we do not need to hand our kids this stuff before they have a need for them and before they feel it themselves. Your son may suddenly witness something while you are out and about that does not feel right to him and want to talk about it. Or maybe you will notice that he feels upset about something that he witnessed and you will want to ask him and help him move through the uncomfortable feelings. You will read books together that will have mainstream parenting ideas and many other things that bring up questions and concerns and discomfort and you will be talking about all of that. He will have an idea of how loving parents act and he will have an idea how to treat other human beings with respect. You know where that comes from because of this glorious free life with you. Where you show him how a loving parent is and you treat him with deep respect and this is his foundation. From this glorious foundation that you are creating together, with the space for him to learn and grow and be, you can trust that he will voice his opinions and concerns and perhaps outrage and upset over something that does not feel right to him. Because it is not in alignment with the love and respect and truth that he knows and has been living with his family. So, for today, I feel it is important for you to take note of the great divide this urgency to enlighten him could create in your relationship and realize that his level of awareness right now is that crocodile. He is simply inviting you into his glorious world of enjoying that crocodile with him. I mean it is that simple right now—is that not a wonderful relief? PAM: Yes, that is beautiful. I just want to echo there are going to be so many moments for these conversations to percolate and to happen. We do not need to hide our children from these social norms, these expectations nor overpower them unasked with our perspective in the moment. They are going to see us over those years, as Anne was talking about, make so many observations and choices for our own lives that will make our perspective clear on things. Because we are living our choices with them right beside us and that is exactly what they are doing too. I think the most important thing to emphasize is just to be willing and open to taking that time to have those conversations when they are sparked. Like Anne said, when they are out and about and notice something or something is bothering them and they are not quite sure what. That is the time that we have in our unschooling lives and it is just important to use those sparks and dive in to the conversations with them. And realize, that sometimes those conversations may feel challenging. They may feel uncomfortable but that is okay, take that time. Remembering it is okay to say, “I don’t know. Let’s find out, let us talk about this a little bit more.” But also, it is not the whole, “sit down I need to share this and explain this and convince you.” No, it is following those conversations and moments in our lives because that is what makes the strongest connection for them—when something relates to their lives and that moment is when the conversations are so beautiful and amazing. Those moments come up so often when you are living over the years. As Anne said, he is just two right now and the most important thing is connecting with him where he is in that moment, so right now with that crocodile. Just being there and living beside him. If this is something that is important to you, you will notice when those things, conversations, opportunities come up. There may be other things that you don’t notice as they flow through but we’re unique beings living together and those are the things that we connect through. I will also share a link to my blog post about the consequences if you focus too much and try to bring your strong beliefs into the conversation on purpose without it flowing; the kinds of consequences that that can have. So, I have a blog post that talks about that and I will put that link in the show notes. ANNA: Okay so, yes, the same/very similar to what you guys are saying and I feel like it is something that we have talked about a lot—I do not want to add weight to what my child is enjoying. When they are enjoying something, I do not want to come in there with this baggage and weight. I found especially with young children and like we have said, your child is so young, is that they take in what interests them at their own level. So, like your son, he’s interested in the crocodile and that was what brought him joy. I think you will find, especially in the early years, how you treat him and how your family treats each other will be a much stronger message than any book or television show. Those are just stories and television and if what they know at home is love, compassion, kindness, that will be their foundation. I will say that I purposely chose older books because I found that they were kinder and had sibling relationships that more closely looked like our home. Newer books tended to have a lot about school and bullying and siblings hating each other. That just did not really resonate with us, especially when they were very young. Books like that came along later and then we had lots of great discussions. So, you can be purposeful about things too and find lots of wonderful books and shows. I also found, like Pam and Anne both said, that all of the issues you are concerned about, we have talked about and talked about over the years. But they came up naturally in conversation related to something that they were exposed to or saw or heard and then THEY wanted to talk. They really did initiate those conversations. They started to see that we did things differently and they had questions about that and why would someone not be kind to their child in that situation at the store or whatever they were exposed to. You know now, all the time, we have political chats and sharing ideas about what we see in the world. They talk about what they want to do going forward with friends and ultimately if they have a family and those type of things. There is so much rich time for discussion in our unschooling lives. I feel like kids are influenced by our actions and how we move in the world. So, those are things that you can be intentional about now, from the beginning. But yes, let him enjoy the show and delight in the things that spark an interest for him because nobody really wants to be excited about something and come to someone and have them sit down and have a lecture about all the problems in the world—that’s just handing that weight when I was bringing something of joy to you. See that joy and spark in his eye, focus on the fun and connection and trust that there is plenty of time to talk about ideas, if they become relevant and important to your child. Those conversations will come and they will be amazing for you both. Like Anne said, we have had the richest most interesting conversations and I have loved watching them develop perspectives that are similar and they came from our family but yet so different too. I have learned so much and I just think you have all of that richness ahead. It will be so fun! ANNE: Also, just want to recommend a movie that maybe you could get to watch yourself if you have not already seen it, it is My Neighbor Totoro by Hayao Miyazaki, and it is, as most of his movies are, just wonderful for little kids. They show beautiful real family relationships and not so much the American version of encouraging sibling rivalry and disrespect and everything. So, if you got that for yourself and sat down and watched it maybe your child might enjoy it. Jacob fell in love with it before he was two years old and still loves Miyazaki today. ANNA: Yes, and is that not part of the fun of the journey too? Finding these more unconventional resources and art—oh, I have loved that part of the journey. ANNE: You just relax, your whole being relaxed because they are more like us so this feels right, this feels real and we are loving this so much and so very cool. PAM: I was just going to say that on our vacation in Florida we went to Epcot and the Japan world store was where we spent our largest chunk of the whole day. That was where we had so many connections and they just loved it so much and that is the only place we got souvenirs really. ANNE: Where is my Totoro souvenir, Pam? ANNA: Okay, I am going to go ahead and go to question two. Let me start by saying how much I appreciate the work you three are doing. We would definitely not be as far along on our unschooling journey without you!! And we certainly wouldn’t be deschooling with as much joy and kindness without your frequent gentle reminders. I am so grateful for you three women. I have three beautiful children. An 18-year-old daughter, a 12-year-old son, and a 3-year-old son. I also have a wonderful, handsome, supportive (if kind of skeptical of unschooling) husband. I am an American who moved to Ireland at age 20, met my husband, and have been here 20 years. I have no family here and not very supportive in-laws. It is a tiny community and I will always be an outsider. I was told as a child I was too sensitive, too dramatic, cried too much. I spent my 20’s trying to be perfect, so afraid to make a mistake, my mother-in-law looking for any reason to speak unkindly about me to my husband. I had no guidance except my own and I had been told mine was lacking. I second-guessed every move I made. Twenty years ago it was very expensive for me to phone my mother or sister for support, I did it sometimes, but with guilt over the cost. There was no Skype or FaceTime. I was very isolated and lonely. My husband and I stumbled through many obstacles and have made it through the other side stronger and with a much better relationship. However, my daughter was born during this time. With a mother who was angry, lonely, never good enough (in my own eyes). I slowly got better, and she grew with me. I say we grew up together. But she lived through harsh, unkind times. My older son is the one who brought me first to homeschooling then unschooling. We’ve been completely deschooling since May. His story is for another day. Today I am concerned for my daughter. She went to school all the way through. Her high school years were absolutely awful, she was so desperately unhappy. I had no idea I could bring her home. I finally offered to homeschool/unschool her last year of school, because that’s when we found it and started our journey, but she declined because she had come so far, she might as well finish. We have always had a very open relationship, even when I was being the authority in the house. But here is my question. She was out of the house working and spending time with friends most of this past summer, and has now gone to college in the big city of Dublin. We haven’t seen her very much, and all these months that she has been mostly away, the home lives, and personalities of my sons, husband and myself have shifted SO DRASTICALLY, for the better, as we move deeper into unschooling. We are different people!! It’s wonderful, but I feel she has been short changed. She missed it all. There is no do over, I can’t change the past, but how do I make the future better?? She is going through so much change. New college classes (she’s going to acting school, and loves it!! ), new place to live, a big city to learn to navigate, a new job, etc. Now I, her mother, her rock, have changed too, for the better, but I’m not the same person. She is needing to relearn how our relationship works now too. It’s so much. She is very sweet, and good and just giving everything to this new chapter of her life. I am kind to her, supportive, help her with any problem she encounters. She frequently calls and asks for my help, and I use those opportunities to show her how amazing she is. Our relationship is good. I wonder what more I can do for her. She struggles with anxiety over making mistakes and the need to be perfect. She got this from watching me!! She gets panic attacks and has a hard time making decisions. It’s like her brain freezes and fear takes over. I would love for her to be free of this, and I realize it takes time. Do you have any suggestions of other things I could do to help? She is slowly trusting the new ways, she sees how much better things are, and I have spoken to her in depth about all of these things. If you have any words of wisdom or advice of any kind I would be so, so appreciative. ANNA: Well thank you for that, your post is filled with so much love. I just appreciate you sharing that with us. I feel your love and concern for your daughter. My first thought though is, honestly, you are still being so hard on yourself. As you have found better ways, you have changed, and that is growing with life. That is what we are here for. I trust that your daughter had the journey she needed to have and you are still clearly very connected and are already having discussions about everything. I would just keep doing that. Keep being honest and open and share what has helped you and why you have chosen a new path and why you are wanting to leave behind those perfectionist pieces that did not serve you. Trust that she can carve out her own path and find her own way with your love and support. See her with those eyes—not of lacking or having missed out but eyes knowing that she’s exactly where she needs to be. And that you know she’s got this. She will see that in your eyes and your heart and treatment and it will help her as she steps out more on her own. What a beautiful journey. Don’t take yourself out of this moment in front of you now to worry about the past or regrets. Move forward with all the new tools, the newfound joy and connection because that is going to serve all of you. ANNE: Ah yes, I am going to say the same thing only in a different way. Jessica, I just really wanted to embrace you from afar so here I am offering you a warm, understanding hug. I hear you and all is well. It really is. It is so important that you let go of yesterday. It feels like such a huge weight on you. Anna said this, a weight in the form of guilt and it is only getting in the way of any joy and connection you could be making. Even like when you said, “Now I, her mother, have changed too for the better, but I am not the same person.” I think that is showing the weight that you are owning. But you are not the same person, that is okay, we are not supposed to be the same people. The energy can be shifted to knowing that your growth is absolutely good and right and something to be celebrated. I feel like you are still healing from all that you were handed in your younger years and childhood and when you first moved and everything and so to understand that this new discovery of who you are is really truly to be celebrated as a wonderful step to your healing and truly being who you are meant to be. As I said, we are here to grow and shed who we were yesterday in order to become more fully evolved version of ourselves all the time. I would stand tall and say I am not the same person I was because I have grown and evolved into this person I am meant to be and I am still growing and evolving each and every day. I am a sensitive human being and I embrace and celebrate those qualities about myself. I want you to know I know exactly what you are talking about. I am highly sensitive and was told to stop being that way as a child. I have had work to do to fully learn to love and celebrate myself exactly as I am and it is truly necessary and amazing work. My sessions in Childhood Redefined Unschooling Summit focus on that work. It is an intensive session to healing and knowing yourself and many people have been able to shed their past pain from doing that work that I offer. So, over here is your daughter, she is also doing the work of becoming who she is and also simply being who she is. She is doing this in her own way with the tools that she has. You cannot go back and change that and that is why all is well. Now I want you to look at the sentence you wrote: “She is needing to relearn how our relationship works now too.” To me this feels like a lot of work and kind of an expectation that you are handing to her. It feels like you feel like SHE has the obligation to learn who you are now and how to navigate your relationship. I do not think she needs to have any of that in her life. As Anna was saying, you can simply show her who you are now by being who you are. You can live in a place of such goodness where who you are now is deeply in love with and fascinated by and interested in this person that she is now. Because what has not changed between the two of you is the fact that you are her mother and she is your daughter and oh my goodness, yes that is one of the most precious things in your life, being her mother. That is all you need to convey to her is that you are interested in knowing her. I completely understand that because of your earlier years you may be wary of letting your guard down with who you are now. You have been told that you are not right to simply be who you are. That was a lie. I want you to know that. You are perfection. You can embrace who you are. Now is the time to know that and heal that. So, my concern is that in your protection of yourself and your beautiful sensitive spirit, you might be holding back on truly giving all that you can give to your daughter. You fear that you have handed her things that made her life difficult and yet now is the time to know that because you have become who you have wanted to be, the mother that you want to be, that nothing can take that away. You are no longer the victim of other people’s opinions and words and criticisms any more. You are the creator of your own life, of your own story, of who you are. Nobody can take that away and so you do not have to guard yourself anymore. You do not have to protect who you are now because you simply are. In this new space of your glorious being-ness, you can see that you have so much love and goodness and joy to share. I want to remind you that you are whole and so you can give so much of yourself to your daughter and not lose one tiny bit of who you are. You can be the one jumping into knowing who your daughter is now and loving and celebrating everything about her. In fact, you will become even more of who you are in the space of this amazing new connection and relationship with your daughter. I really just want you to celebrate who you are as fully as you can because you are free, you are whole and there are infinite possibilities ahead of you in each moment. You can let go of past pain and give of yourself and live and love in a place of joy and allow others to shine in your light too. Your daughter does not need to learn who you are. It would be freeing and so rewarding for you to simply be who you are now and give her the gift of a joyful, happy, weight free relationship that focuses on her and her joy and the things that make her shine. That is how she will see how to live without the weight that you feel she has picked up from you. Just be who you are now. Dive into the things that make her who she is. Focusing on her shine. PAM: Hi Jessica. Thank you so much for your question. The one thing that jumped out at me was when you mentioned that you felt like your daughter has been short-changed because she has been away while you guys have been embracing and diving deeper into unschooling. What jumped out at me was, no, she was off doing the things that she chose to do. She was working. She was at this college, going to acting school, loving it. She was hanging out with friends. That is part of the celebrating our children—you can see the joyful things that she is doing in this moment and celebrate those awesome things with her. You create the future by being who you are now so each time you have the opportunity to engage with her. As you say, your relationship is good, you are going to have these moments and bring yourself, the person that you are now to those moments. My kids were in school for a few years and I do understand that guilt. What helped me as I was processing through that was the realization that there really was no value in holding on to that guilt and seeing everything today through that lens of the past. Literally, it is not helping you to help her. It is getting in the way and making things harder. So yes, when that guilt would kind of bubble up inside me, I would acknowledge it, understand where it is coming from and then take the next step and realize that it is getting in the way of me engaging in this moment with my children. So, that was kind of a mantra for a while and that helped me move through it quickly and be able to sink into the moment with my child, my children. Remember to give things time, as you said, she is slowly trusting the new ways and sees how much better things are. Realize that you, yourself are a shiny example to her that things can change. You know, just love her and support her as best you can in each moment. Again, focus on each moment. Do not overlay any expectations on top about what it might take because really, as Anne and Anna both said there is no end, we are all learning and growing and changing our whole lives every day. Each day we bring who we are today to each moment and to how we engage with all the people in our lives. Just as you are doing with your husband and your boys, who are at home. Bring that same self to your interactions with your daughter. So, yes, I think it is doing that work to process through the guilt so that it is easier to bring yourself into each moment with her. Releasing any expectations on the future as to what you think it should look like someday or someday soon, because all those things, they take you out of that moment. They take you out of realizing who you are because all those other things are skipping in your mind and you cannot release and focus and just be in it, be in that moment with them. We live in Chicago with our 3 and 6-year-old boys. We are pretty new to unschooling, but enjoy reading Sandra Dodd, John Holt and listening to your podcast. We have been trying more and more to let go of rules/control, focus on our children’s interests and cultivate nurturing relationships with them. The majority of the unschooling philosophy resonates with us, but we are struggling in one area in particular: screen time with our 6-year-old. I really want to let go of the regulating and not be this person in his life who is just there to say, “yes” or “no.” I want him to be able to learn to regulate himself, but I harbor my own anxiety about the hours that he is at the screen. He mostly plays games on his personal tablet or watches videos. But he is not like my 3-year-old who will watch or play on his tablet for a couple of hours and then move on to other things. My 6-year-old can be on his tablet or watching TV all day. When it is time to go somewhere he is able to turn it off and engage with us in an activity, he does have other interests and moves in and out of things like researching sharks, but if we are at home it is what he most wants to do. He will talk constantly about it, say things like, “I only want to play with my tablet,” or “All I can think about is my tablet.” I try to engage with him in other activities at home like Legos or games, but this usually only lasts a few minutes before he is asking for his tablet again. When he is overwhelmed or anxious he asks for his tablet, sometimes he says, “the only thing that can make me feel better is my tablet.” It makes me sad and anxious to hear him say that, like his tablet is his only way to manage his feelings. Sometimes I feel like on the days that he is on his tablet a lot that later on he is extra cranky or has trouble falling asleep, sometimes saying that he can’t stop thinking about the games he plays. (Or is it all in my mind?) We are all very close, he is a very sweet and kind boy. He is very sensitive, to the point of some sensory processing issues, but nothing that interferes majorly with his functioning. Just something that I pay attention to and try to help him learn how to manage. So, is the tablet thing solely my own anxiety that I need to address myself or is there anything to the growing body of evidence that there are negative effects to being at screens for multiple hours a day? Do I go totally hands off and not worry that there is long term negative crutch-like relationship being formed with his tablet? Or is there ever a time where some limiting and parental management is a good idea? PAM: Hi, Abby! Thank you so much for your question, I thought it was really fascinating. Quick answer: no, don’t go totally hands off. But, here is the really important thing that I am going to be focusing on: do not go to parental management either. Go to that beautiful space in between those two extremes which is engagement. By engagement I mean have conversations with him about things. Like, when he says (this jumped out at me), “The only thing that makes me feel better is my tablet.” Do not focus on the tablet part. That is the tool he has chosen to deal with his feelings and it is the one that is working best for him right now. Focus on the root of the challenge, the overwhelmed part. So, what is feeling overwhelming? Why? Are there things you can do to help head off that overwhelm before it hits? Are their ways to manage his environment so he does not feel overwhelmed as often? The other clue that more engagement will be really helpful for you guys is noticing that all your conversations, your and his comments are all about “The Tablet.” So, think about taking them deeper. As I mentioned, the tablet is just the tool, the doorway. It is what he is doing with the tablet that helps him feel better, right? Dig deeper to learn more. What is he actually engaging with? What videos? What tv shows? What games? What does he enjoy about them? I promise you that you will learn so much more about your child. Then embrace and celebrate those things with him. The tablet is the doorway. What is on the other side? Another thing that jumped out to me was, I was asking myself as I was reading, “What if he had complete access to his tablet?” Then he would not even have to ask you for it. Again, you want to get rid of being the yes/no person. I think that in itself will decrease his anxiety over all. His, “All I can think about is my tablet,” comments. If his tablet is always at hand, all that goes away. Then he can finally start thinking about the real questions like, “Do I want to play a game on my tablet or play with the Legos?” Then he has a true choice and it is then that he will be learning so much about himself. Then how about revisiting that idea of a negative crutch like relationship. What do you really mean by that? Do you mean support? Like, actual crutches are very helpful for people who are having a hard time walking. What if these are tools that could help us move through challenging overwhelming times? You know, if we think of it that way. That does not make them bad—a crutch is useful. Maybe rather than thinking of it like a crutch, what if you think of it as a loving security blanket that brings some peace and comfort in overwhelming moments. So, once you and your son are talking about the root of his overwhelm, rather than just the one tool that he is finding helpful right now, he sees that you are entirely supportive of his tool of choice, so now you have that relationship trust there. He knows that what he is doing is okay. He does not have to feel that the tool that he is using in the moment is being looked down upon. He will, at this point, likely feel more comfortable exploring some other tools, as well, to see if he finds them helpful. Then maybe he will have two tools and then, in a moment of overwhelm he will have a choice. Also, along the same time, you guys will be paying attention to his environment, seeing if you can tweak things so that they are less often overwhelming and that he is in need of coping tools less often. And again, spend lots of time with him as he enjoys his games and videos on his tablet so that you understand, it is not the tablet. See what he is doing. Now you will be understanding what is bringing him joy. It is not the tablet itself; it is when he turns it on and when he uses it. Once you understand his joy, you will be able to dive in and celebrate that with him. In doing so, you will be celebrating him and his choices. The ultimate goal of all this exploration with him is not to reduce his tablet use. It is to get to know him better and to help him discover ways to minimize and process those overwhelming moments that you are worried about. You may find that once he has relaxed access and his tablet use fades from feeling like a need to becoming a true choice, he may still continue to choose it regularly. Maybe he just enjoys the things that he can do with it more than his younger brother does and that is totally okay too. I just wanted to mention, you talked about the growing body of evidence of negative effects. I know I can share links to a growing body of evidence about the positive effects. So, instead of relying on experts, I think what helps us most is to observe and engage in our own lives, with our own children and learn these things for ourselves. Remember, most of these studies are not done on unschooling children. And their lives are so very different, their relationships with their parents are so very different. You know, figure these things out and explore how all these different tools and activities and things relate in our lives with our children and the joy that it brings them. ANNA: So, not surprisingly a lot of the same things jumped out at me. I do just want to say one more time to really look at that language we are using because when you say screen time or even his tablet, it does not give you or us a full picture of actually what is engaging him. What is he watching or doing? What does he love about it? There is so much room there for you to understand a lot more about him and what he loves, just like Pam was saying. I would also look at patterns and it sounds like you have done that a bit. You know he uses it at home and it also seems to help him when he is anxious. Seeing how he uses the tool gives you an insight into what is going on with him and if there are things you can do to make the environment less stressful and Pam touched on that too. I cannot imagine ever wanting to take away a tool of comfort from a person. You mentioned that he does go outside and he engages in these other activities with you and it sounds like he enjoys that time engaging in the games and videos to decompress after he has been out and about. And that is so, so common especially if he tends toward being an introvert. So, maybe just be aware of that if you have a different personality, if you are more of an extrovert that may seem more foreign to you but it is very common for me to go out and enjoy being out in the world and then come home and curl up with a book or go straight to my computer and kind of shut the world out. I would try to set aside the outside noise about this topic and, just like she said, the experts saying this or that and just watch your child, engage, learn more about what he loves. Then use that place of deeper connection and knowledge as a base for further discussions if needed. And I think you will find it just flows from this really organic place of connection versus a top down or an outside influence or expert oriented opinions. You know you and your connection with your child, that is what will guide you. ANNE: Yes, you hear the same things in Pam language and you hear it in Anna language and then you hear it in Anne language and it is wonderful. Abby, I am the mother of a twenty-seven-year-old who experiences anxiety. He is highly sensitive. He is an empath. He has sensory processing challenges and he has always been filled with such a deep kind of knowingness of the world that often that world is just too much for him and, man, I can relate to that. Because he has lived a life where he knows that it is good and right to follow the things that bring him joy, he, with my assistance, learned what it was that he needed in order to find relief from the weight that he carried on his shoulders; the weight of the world. We actually created our entire lives in the direction of bringing relief and joy to Jacob’s happy heart at times. He loved playing his games because they brought him that joy and relief. I always did what I could to help him get to the place of finding that joy and relief from anxiety, relief from the weight of the world. How could I have chosen otherwise? How could I have ever resented that thing that brought my delightful, intuitive, highly sensitive, creative, brilliant, son joy and relief from feeling the weight, from wanting a wonderful distraction, from what feels like weight to him from the world. Same thing as Anna said, going out, highly sensitive people, introvert, whatever. We get home to our ten acres on top of a mountain and we are so happy to be home and alone again. Yes, we go straight to something that feels good. So yes, this is our unschooling lives. We have always walked toward the things that have made our children feel good. And I have always helped them get more of that which allows them to feel good because we know for sure that the place where we are meant to be, in joy. I love the word enjoy because that is what it means, in joy. If you get to that place of enjoyment, that is where we are meant to be, you know, free from carrying any weight. Walking in the direction of getting more of those things that make us feel good. So, that alone is a reason for you to let go of the judgment and weight you are handing to your son with your definitions of what he should be doing and who he should be and how he should be. But another reason is because I do feel he is highly sensitive, as you said, and he can feel this judgment and this disapproval when he is happily engaged in his games on his tablet or whatever he is doing on his tablet. So, that is just more weight that is being handed to him that his being-ness does not really need. Jump into that joy with him, free him from any anxiety that you may have been handing him about doing that which he loves to do and you will learn about what he is doing. You will discuss it with him enthusiastically and in an interested way because he is your child and you are interested in everything he is interested in. Do you feel how joyful that feels and how light and floaty that feels? I mean, I feel like I could fly, that feels so wonderful! Instead of being weighted down with judgment and fear. Most of all, look at the tablet itself and make peace with that. You might want to say, “I’m sorry, tablet, I was judging you.” [laughter] And so, a pivot to deeply appreciating that thing in your son’s hands, what a gift it is to his being-ness and his sensitive spirit. It is this tool that your son knows to go to, to help him when the world feels like too much to him. My goodness, that is a beautiful thing. Then when your son knows that you are supportive of him feeling good and you would not take that feeling away from him for anything, then he will be up to release the fear of your judging him and there will be less weight on him. For my son’s twenty-seventh birthday in September, my husband and I chipped-in with Jacob’s fiancé to buy him a Nintendo Switch. I have tears in my eyes because I know for sure and I am so happy that when the world feels too much for him he goes straight to his games to find joy and relief and just down right fun, you know? Does that not feel great? Is that not wonderful? I love that. I am done. PAM: I love that too because again these are—I feel like I say it over and over again—but these are the roots of being human? It is not dependent on age. These are not even things just for kids. We are trying to figure out what makes us comfortable and not even bringing that judgment into our own lives when we find these tools that work for us, or feeling guilty about those choices. ANNE: And it is going back to question one, with how we spoke about the foundation for this child is deep love and respect from his family. So, you know when you are looking at this as great value to your child’s peace of mind and peace of heart and saying, “I don’t like that,” that is the shift that has to happen to finding a place of respect for that thing so that the child can see the rest of the world through those eyes; from the foundation where he and what he values is deeply respected. I’m a dad of two awesome kids 3 and 5 and recently came across unschooling. While I’m continuing to learn more about it, I’m having trouble enacting what I’m learning. I’ve always been considered the “easy going” parent, and I get a lot of push back from my partner saying I’m just being lazy and letting them walk all over me. I don’t feel like that at all. To me, I’m trying to let them learn and explore how when and where they want. It’s become a source of discord among us, but when I try and teach her what I’ve learned, I’m told that since I’m away all day I don’t know what really works. She also went to school for education and feels that her studies make her the more qualified patent when it comes to teaching the kids. I disagree with the traditional style of parenting and see huge differences in their behavior depending on how they are being parented. My son in particular struggles with traditional boundaries of specific meal times and bed times and both often turn into hour long crying sessions as he’s forced to stop playing and conform to what’s convenient. I also have concerns for my daughter who is in kindergarten and already counts down to the weekend. I hate to see them both struggle every day. Occasionally my partner will recognize the difference in behavior, but just chalk it up to them missing me during the day, and not because I let them dictate their own behavior and preferences. I’m not sure what to do going forward. I feel like unschooling is something both kids need, but I’m not sure how to give it to them without the ability to be a stay at home parent or change my partners views. PAM: Thanks so much for your question, I really appreciate it. When I was reading it, what jumped out to me the most was the possibility of framing this as a parenting discussion, not a schooling or unschooling discussion. As you say, you see huge differences in their behavior and how they are being parented—and the issue of education is also being brought in through your wife’s, I assume she has a teaching degree—but all the stuff that you are talking about, the examples that you are sharing, are all parenting things, they are not unschooling things. So, I was thinking maybe start with conversation around attachment parenting. You could both read and chat about Alison Gopnic’s book, The Gardener and the Carpenter: What the New Science of Child Development Tells Us About the Relationship Between Parents and Children. I know Emma and I talked about that book an Episode a while ago so I will share that link in the episode notes as well for anyone who is interested. Maybe subscribe to Scott Noelle’s Daily Groove e-mails as conversation starters. You might also get some good ideas from my Learning is Learning blog post which I will link to too. Just read through it from a parenting perspective rather than an unschooling perspective. Being confrontational and trying to convince another person they are wrong or trying to teach another person in the way you put it in your question, does not create a great environment for learning. It makes a person feel defensive and shuts that learning down and that is what you are seeing. Instead, truly understand and validate her perspective. Choose to step out of that power struggle that you guys seem to be caught in. You can meet her where she is. That does not mean that you need to make the same parenting choices. But see that her choices are rooted in a deep love for your children, as are yours. So, that is where you can meet her. That is where you guys can connect. Eventually, unschooling can, may, will, probably come back into the conversation. It just seems like at this point, parenting styles is your bigger concern. Then that takes the whole school question out of the equation for now. Which is just fine because you want to work with her on coming to some consensus, or at least understanding of each other, on parenting choices. That will be an ongoing conflict if you don’t do some work there and that is not going to be helpful for your kids either. If you have not yet listened to my conversation with Robert Gottlieb which was episode 93—I will share that link too—because he found unschooling and brought that to his family and he shared some great thoughts around that in our conversation, as well as his suggestion to not do it the way that he did it. And he is open to especially unschooling dads but to anybody reaching out to him on Facebook as well to discuss that further. ANNA: Yes, again, thanks for the question because I think it is one that spins around out there sometimes. I think it can be really hard when partners are not on the same page. So, I just wanted to let you know that we hear you with that and hear your frustrations about that. The cool thing is, all of the skills and connection that we talk about with our children work with our friends and partners too. It is the foundation of how I operate in the world in all of my relationships. So, active listening, validation, open lines of communication, not going into a discussion with a set outcome, all those things are so key when it comes to relating to one another. I am guessing that she is probably feeling defensive right now. Being the main caregiver for young children is a full-time job and if you can focus on listening and validating where she is and what she is experiencing, that can really open the lines of communication that seem closed right now. When you get there, when you get to that place where she is truly feeling heard and understood then I think that you will see sparks of interest and learning more or getting your perspective or finding out the things that have been sparking an interest in you. You know, as Pam mentioned, she has tons of resources on her website, some of the books she has mentioned and podcasts. Our Childhood Redefined Summit will be opening up again after the first of the year and I think what would be cool about that is that it’s something that you could do together. So, I think it is a place of where you are starting together and learning going forward whether it is attachment parenting information or things about unschooling or just your journey. I think that could be something that brings the two of you together. I think just being open and staying connected will help you both. We talk a lot about not pushing our own agenda with our kids, it is really the same here. Listen, connect, grow together. Learn from each other. ANNE: Yes, I have nothing more to add you guys said it all. It fit perfectly and wonderfully and not even in my own language because it was very good, I agree. PAM: And that is our last question for this month. I want to thank you both so much for answering questions with me, it is so much fun. Just a reminder, there are links in the show notes for the things that we have mentioned in this episode. As always, if you would like to submit a question for the monthly Q&A episode, just go to livingjoyfully.ca/podcast and click on the link. I just want to say congratulations to Pam for her 100th podcast episode! It is really so cool that it happens to be with the three of us together. I am just so grateful for the work she is doing and I know how many lives she has touched and I am grateful to be a part of it. ANNE: Exactly. And I don’t think we know all the lives she has touched because the ripple effect is just so incredible and we only see and hear pieces of it. PAM: Thank you so much guys, that was lovely!! Thank you!